WHAT IS THE PROGRAM AND WHY DO WE HAVE IT? The role of the Membership Committee is to encourage and support the nationwide effort to attract and retain a diverse, active membership. 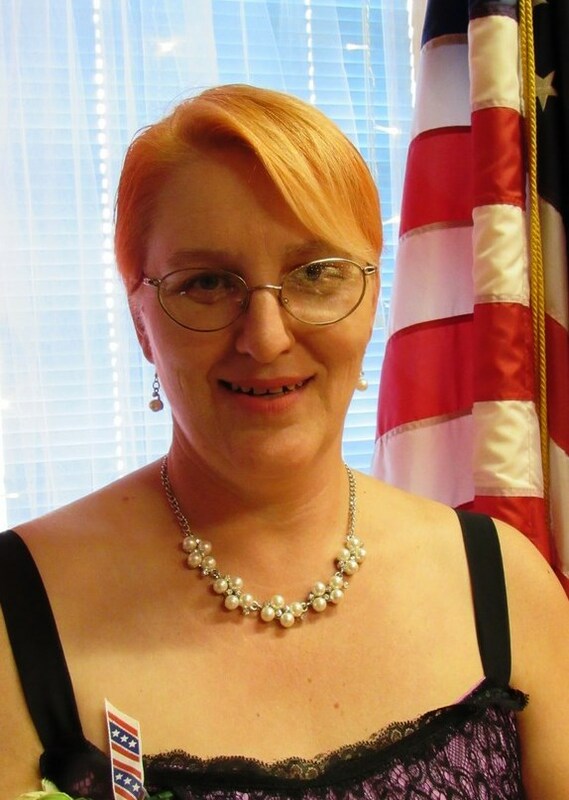 Members enable us to carry out our mission to assist veterans, military, and their families. What is a member in good standing? A member who is current with annual dues is a member in good standing. A member failing to pay annual dues by January 31 of the current membership year, shall be classed as delinquent and shall be suspended from all membership privileges. What is the value of a volunteer’s time? To enhance a member’s volunteer contributions, offer ideas and opportunities in which members can support and deliver the Auxiliary’s mission. o Examples for members: Volunteer at a VA Medical Center serving as veterans’ escorts to appointments, participate in a stand down to provide necessities for homeless veterans, mentor military children with the big brother/big sister concept. Recognize all members for any and all contributions — volunteering, serving as a chairman or officer, preparing food, organizing events, being a mentor to new members, contacting other members to renew, being a good example of Service Not Self, etc. Help members set up a user profile on the national website, www.ALAforVeterans.org, so that they can access the “Members Only” section and take advantage of all the tips and tools available. Ensure a positive experience for all members. Be welcoming, kind and respectful to members of all ages and backgrounds. Ask for new ideas and be open to them. Encourage personal contact between members of the unit. Demonstrate Service Not Self in all activities and interactions with others. Realize that not all members will attend meetings, and be respectful of their choice. Create meaningful participation. Recognize all members for any and all contributions — volunteering, serving as a chairman or officer, preparing food, and organizing events. Rid units/departments of member discrimination. Establish a membership committee or team to support efforts throughout the department. Hold regular information sessions to refresh members on ALA programs. Ask members to participate in programs they are passionate about. Establish a membership committee or team to support efforts in Units. Deploy active and consistent communication with units and districts/counties. Share contact information of committee/team with units. Use membership tools, available at www.ALAforVeterans.org, and ensure all units have access to all membership resources. Utilize your committee/team by giving them an assignment to make your program a success. Identify former and expired members: Use the ALAMIS member database, or contact your department headquarters, to obtain a former member report, expired member report and/or a current year unpaid dues roster. Reach out to former/expired members: Set up a committee to establish a phone bank of members who will call former members. Meet periodically to make calls – monthly, quarterly, semi-annually. Develop a script to identify reasons for not renewing and what would cause the former member to consider rejoining. A sample phone script is included in the “How to hold a revitalization event or participate in TAL District Revitalizations” how to sheet. Send follow-up letters to those contacted, thanking them for taking the time to talk with you. Send letters to those you were unable to reach (see “How to hold a revitalization event or participate in TAL District Revitalizations” for a sample letter to former members). Share former members’ feedback with the unit; determine what the unit might need to do differently to retain all members. Ensure a positive new-member experience. Personally contact a new member shortly after she joins. Provide a personalized welcome letter from the unit president or membership chairman. Also send a New Member Kit, available at www.ALAforVeterans.org, and personalize it for your unit and department. See “Suggested Additions to New Member Kit” to help create a complete new member packet. Find out how a new member wants to be involved and which volunteer activities might best suit her skills and interests. Utilize the interest form provided in the Leadership Programs Action Plan. Offer a variety of volunteer opportunities in which new members can participate, at times convenient to them, to support and deliver the Auxiliary’s mission. See the ALA Service Not Self Volunteer Toolbox at www.ALAforVeterans.org for tips, ideas and strategies on how to be a better volunteer. Be welcoming, kind and respectful to persons of all ages and backgrounds. Do not expect all new members to attend regular meetings; be grateful for whatever way she wants to participate, even if only to pay her dues. Increase the ALA’s visibility in the community. Increase community involvement by using ALA programs that encourage responsible, active citizenship supporting our military servicemembers and their families. Engage other community-based organizations in ALA projects such as welcome home/deployment events, support of military families and providing services that may include plumbing, carpentry, childcare, etc., for families of those deployed. Volunteer at schools, giving flag demonstrations and serving as mentors, with a special emphasis on military children and the issues they face with deployments and transfers. Contact JROTC leaders to assist with projects. Encourage Junior members to recruit their eligible friends and relatives. Identify recruitment target groups such as women veterans, military families, and relatives of American Legion members, ALA Girls State alumnae and local colleges. Ensure the ALA is appealing to new members. Exhibit Service Not Self in all activities and interaction with others. Create a significant membership experience for Junior members. Encourage Junior members to attend the senior meeting to share their vision of the unit. Encourage struggling units to elect Junior members to positions that don’t incur significant liability risks. Examples include: Chaplain, Sgt.-At-Arms, and Historian. Members have the option to renew their dues online. Membership cannot be withheld from a member who chooses to pay her dues online. Once a member has paid her current year’s dues, regardless of payment method, she is a member in good standing and entitled to all rights and privileges of membership. Units have a legal and fiduciary responsibility to process a member’s dues (new or renewal) in a timely manner. Failure to do so is a violation of the members’ rights and due process. Dues received by the unit should be transmitted to your department once a month (minimum). Membership cards are provided by the national organization and shipped to departments to distribute to their units. Units must provide to members their membership card as soon as payment is received. Units must provide membership cards to members who renew online as soon as the unit becomes aware that the member has paid – either by member providing their emailed receipt, notification from their department, or, for Membership 4 units having ALAMIS access, via the “Unit Dues Paid Online” report which is available 24/7. Departments have a legal and fiduciary responsibility to process a member’s dues (new or renewal) in a timely manner; failure to do so is a violation of the members’ rights and due process. Membership cards cannot be withheld from units for any purpose. Distribute membership cards and rosters to units in a timely manner so they can be promptly provided to members upon payment. Encourage units to sign up for access to ALAMIS. Units having access to ALAMIS can minimize work for the department by entering new members as pending members, update their member’s profile, run reports showing who has and has not paid dues, and can pull the “Unit Dues Paid Online” report which means that units can promptly provide membership cards to members who pay dues on-line. Mid-Year Reports - Department due date is December 5, 2018. Mid-year reports reflect the program work of units in the department. Each Unit is required to submit a narrative report by December 5, 2018, to the Department Membership Chairman. Year-End reports - Department due date is April 15, 2019. Annual reports reflect the program work of units in the department. Each Unit is required to submit a narrative report by April 15, 2019 to the Department Membership Chairman. How is your Unit encouraging renewals? Provide three examples. Has your Unit implemented new/innovative ideas or practices to increase renewals and/or sign up new members? If so, what are they? Please include all off site, out of Post Home, and Community membership drives, photos and Narratives are very important. Member Award: R5 Recruit & Rejoin 5 - Guidelines: Members who recruit or rejoin five (5) or more Junior or Senior Auxiliary members. Rejoined members must not have paid dues since 2016. One entry per recruiter. Certification forms must be received in National Headquarters no later than May 1, 2019. Member Award: Silver Brigade - Guidelines: An Auxiliary member who recruits 25 or more new 2018 Senior Auxiliary Members will qualify for enrollment in the Silver Brigade of the American Legion Auxiliary. TAL and SAL members are also eligible to receive this award. Certification forms must be received by National Headquarters no later than May 1, 2019. The first renewal notice will be mailed/emailed by September 15, 2018 for the upcoming membership year. A second notice is mailed (no emails for the second/final one) by January 15, 2019 for the current membership year to members who have not paid dues by the beginning of December 2018. Units are encouraged to supplement the national renewal notices with unit generated renewal notices and personal phone calls. The ALA membership year is from January 1 to December 31. Seating at National Convention will be based on best overall membership performance as of 30 days prior to the 2019 National Convention. I.E. : Departments that gained the most or slid the least compared to the same time the previous year. Using the updated 2019 membership category groupings*: Departments will be sorted by best overall membership performance within those categories. The top department from each of the six category groups will sit towards the front at National Convention. All other departments will be seated based on overall membership performance (not by category groups). ALA Unit Guide Book, available at www.ALAforVeterans.org http://www.ALAforVeterans.org or from American Legion Flag & Emblem Sales. 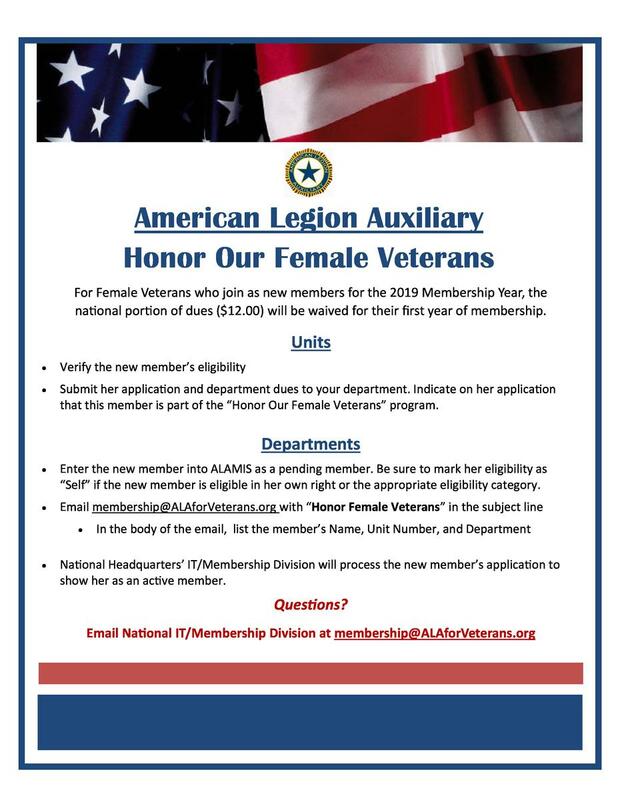 TAL Family Brochure, AEF Brochure, Scholarships Brochure, American Legion Auxiliary Girls State Brochure, Member Benefits Flyer. How to Create a New Member Packet - Personalize the New Member Kit with additions that are unique to your unit. Additions could include: Welcome letter from your unit president, Membership card and pin (Pin is optional) Unit Constitution and Bylaws, Unit budget – A budget communicates a unit’s values and priorities. A unit may use the budget to determine whether resources are being appropriately and beneficially used to achieve its stated mission and objectives. Essentially, the budget is a numerical representation of the Programs Action Plan for a specific time period. Make sure the budget is flexible to allow the unit to take advantage of unexpected opportunities. Identify the sources of the funds and their planned uses. o Unit roster – A list of all of the current members, as well as a list of past officers, district, department and national information, and even local contact information for the press and city officials. Latest newsletter (if applicable) Calendar of events including monthly meetings.